Initially, all placements are enabled for your retargeting campaign. This is the setup recommended by Facebook and we strongly encourage you to keep it. Here you can learn more about how placement efficiency is determined. 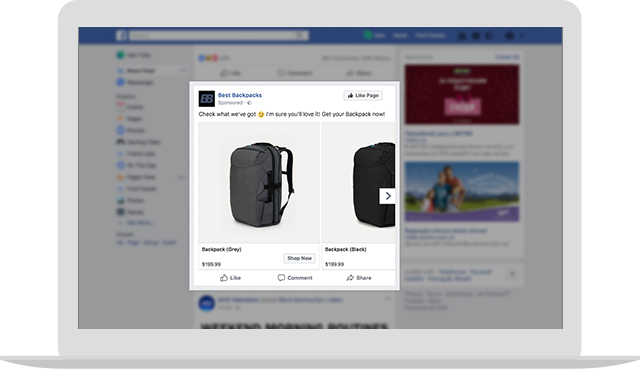 A large ad with 1-10 products from your website designed as a regular post inside the newsfeed. A smaller ad with 1-2 products from your website located on the right-hand side of the screen. This type of ad stays on the screen as the user scrolls through the newsfeed. An ad with 1-10 products that appears in the mobile version of Facebook and inside the official Facebook app. This type of ad lets you give your potential customers a friendly reminder about your great products when they are checking their profiles on the go. This means that the purchase can be carried out even on the user’s way to work or during a commute back home. The ads are shown in mobile version of Facebook (both in app and in browser). Each ad has a large image or a video and up to 50 products dynamically selected by Facebook. 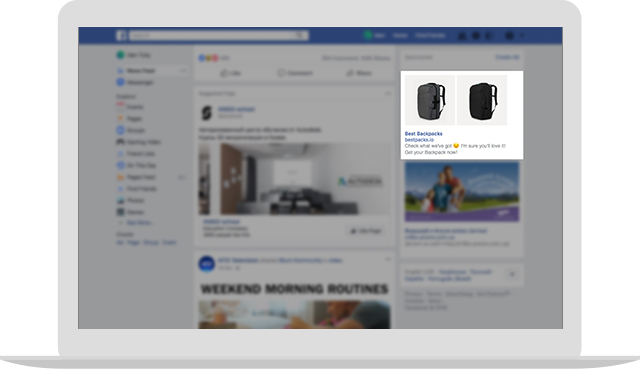 When a user clicks on the ad, it turns into a swiftly-loading fullscreen mobile store powered by Facebook Canvas Ads. Each product, if clicked on, opens a product page on your website where the user can finish the purchase. A 1-10-product ad strategically placed to one of many Facebook’s trusted partner apps. This helps you have a better outreach to the potential customer even if he or she doesn’t check Facebook profile after leaving your website. A 1-10-product ad that appears in the world’s most popular photo-sharing network. Just like with the Facebook Mobile Newsfeed and Audience Network, clicking on the ad takes the user to the product page in the mobile browser so that the purchase can be completed even if the potential customer isn’t at the computer at the moment. A 1-product ad that is presented as an Instagram story. Swiping up the ad takes the user to the product page in the mobile browser so that the purchase can be completed even if the potential customer isn’t at the computer at the moment. A 1-product ad that appears on the Home tab of Messenger app that, if tapped on, takes the user to the product page on your website. Messenger ads help you reach out to more that 1.3 billion app users around the world. A 1-10-product ad that appears on the Home tab of Marketplace app. Each image, if tapped on, takes the user to the product page on your website. Marketplace ads are effective because they are seen in the place where people actively shop. Got questions about the placement’s efficiency? Please, contact Support by clicking on a green circle in the bottom right corner of the page — we are always happy to help.